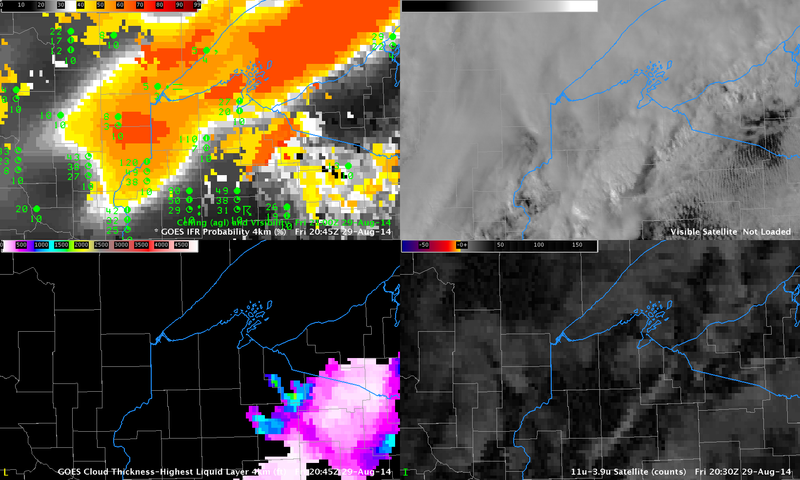 IFR and near-IFR conditions existed near Duluth Minnesota during the day on 29 August 2014; How does information from the satellite help to diagnose the IFR conditions? Both the visible and brightness temperature difference fields, above, show widespread cloudiness, with convective features over Wisconsin and multiple cloud decks over Wisconsin and Minnesota. These multiple cloud decks show no apparent relationship the observed IFR or near-IFR conditions. In cases such as these, the low-level information available through the Rapid Refresh Model is key to providing information defining exactly where the lowest ceilings and visibilities exist. In the case above, that region is centered near Duluth, extending to the southwest. IFR Probabilities are elevated in regions where visibilities and ceilings are low, and they increase as the cloud ceiling increases. 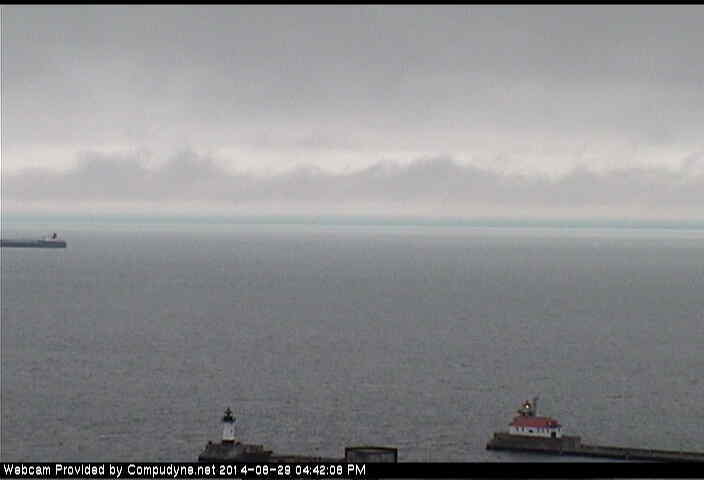 The image below shows Duluth Harbor at about 2140 UTC; the low ceiling is apparent (Source). This entry was posted in Multiple Cloud Layers, Northern Plains on August 29, 2014 by Scott Lindstrom. GOES data indicated widespread stratus over North Dakota and adjacent states early in the morning on 27 August. The image above demonstrates several difficulties that come with using the brightness temperature difference field to identify regions of reduced ceilings and visibilities. A stratus deck (over eastern Montana) and a fog bank (over central North Dakota) can have a very similar signal in the brightness temperature difference field. Furthermore, regions where ice crystals comprise the clouds (southern South Dakota) show a different signal. Low-level stratus will be invisible to the satellite at night if it is beneath a higher-level cirrus shield. IFR Probabilities for the same time, below, more accurately define where the lowest visibilities and ceilings occur because Rapid Refresh Model data are used to identify regions where part of the lowest layers of the model atmosphere is saturated. 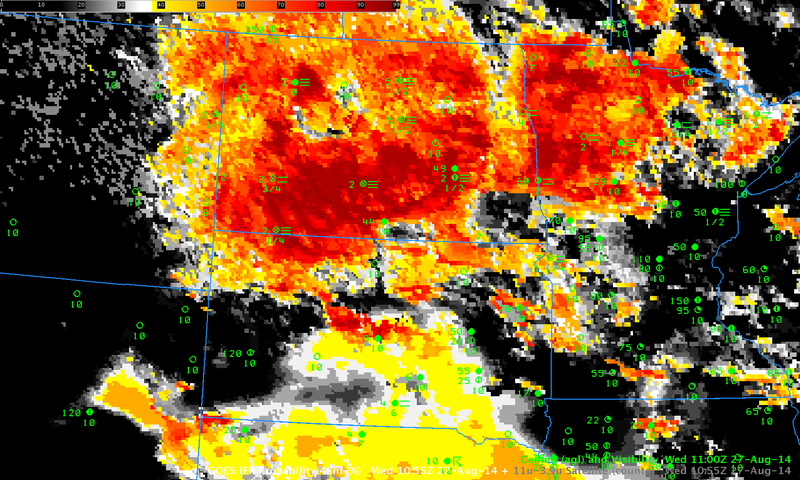 If there is saturation below higher clouds (southern South Dakota), then IFR Probabilities are increased. If there is not low-level saturation in the model in regions where low stratus/fog is present, then IFR Probabilities are reduced (eastern Montana). Note also how the character of the fields changes if satellite data are not used as an IFR Probability predictor. IFR Probabilities in southern South Dakota (where multiple cloud layers are present associated with a convective feature) have a uniform look to them, as they are derived solely from model-based fields. 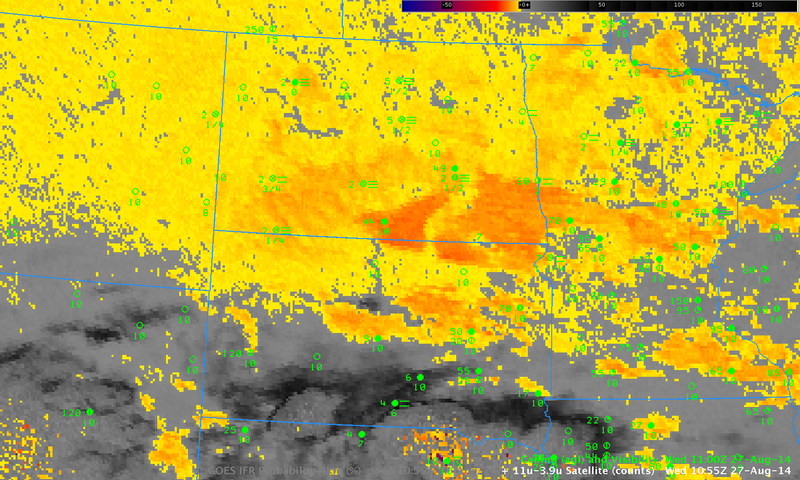 Over North Dakota and Montana, satellite data can be used as a predictor; the individual satellite pixels are obvious. When only model data are used as predictors, the probability is reduced. Thus, the color yellow in a region of model-only prediction (southern South Dakota) should be interpreted differently than the color yellow in a region that uses both model and satellite predictors (North Dakota and Montana). This entry was posted in Northern Plains on August 27, 2014 by Scott Lindstrom. 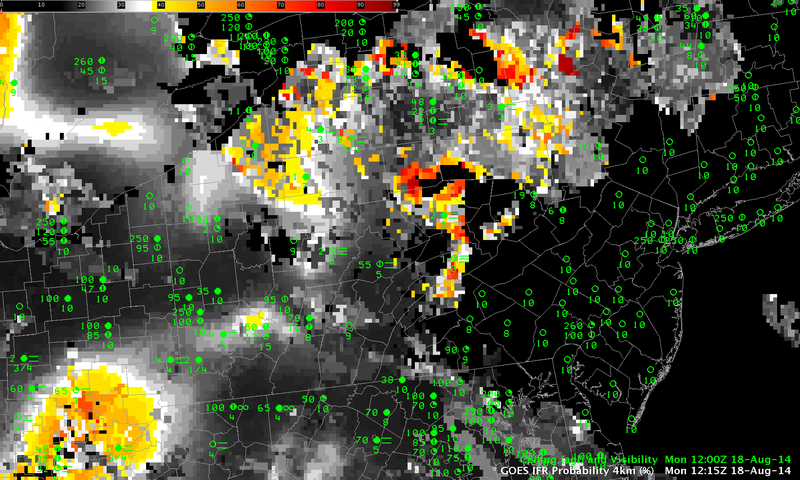 A small area of IFR conditions developed over southern Indiana during the overnight/early morning hours of 20 August, and the imagery in this post serves as a good tutorial for how to interpret GOES-R IFR Probabilities. The 1300 UTC imagery, above, is from after sunrise; therefore, the cloud-clearing algorithm (that includes visible imagery) will do a good job of screening out regions where widespread fog is not present (Compare this image to the 1000 UTC image that cannot use visible imagery below). The highest IFR Probabilities are confined to the region over southern Indiana where ceilings and visibilities are near or below IFR conditions. The effect of a large convective complex with multiple cloud layers on the IFR probabilities is apparent over Illinois. There, IFR Probabilities have a very smooth appearance because satellite predicitors (which predictors can be pixelated in appearance) are not used: only model data are driving the IFR Probability over most of Illinois. The Brightness Temperature Difference field, below, (10.7 µm – 3.9 µm), the heritage method of identifying regions of low clouds, displays the difficulty inherent in the field after sunrise: solar radiation with a wavelength of 3.9 µm changes the character of the difference field, making interpretation difficult. The GOES-13 Brightness Temperature Difference field at 1000 UTC, below, has a more characteristic look for a scene with fog and low stratus present. 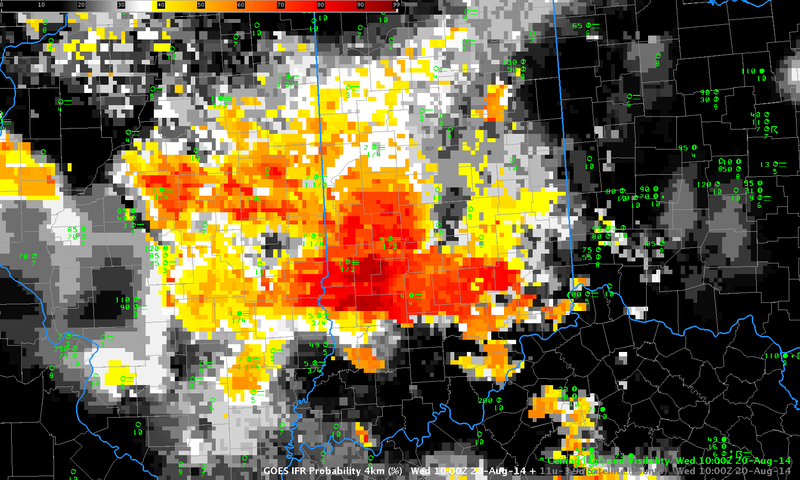 However, the signal overpredicts where reduced ceilings/visibilities are actually occurring. 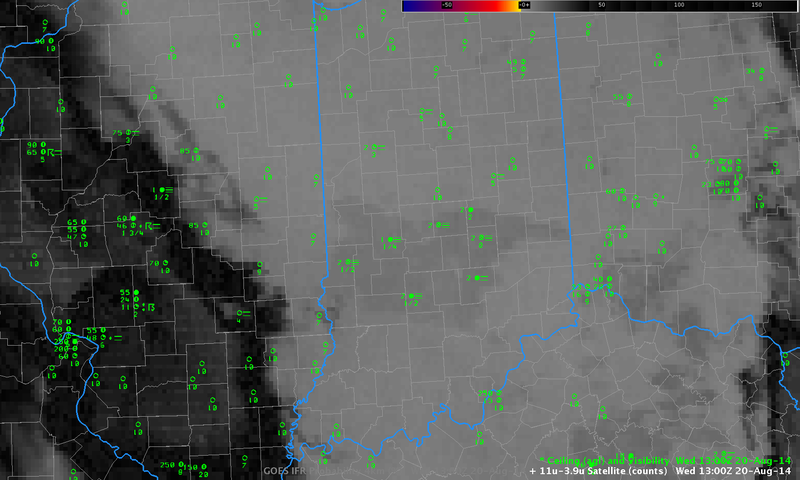 Mid-level stratus and fog can look very similar when viewed from a satellite. The IFR Probability field at the same time (1000 UTC), at bottom, has highest probabilities over the region of IFR conditions — over southern Indiana. Some regions with a strong Brightness Temperature Difference signal — for example, in western Illinois near Moline/Davenport — have a comparatively weak IFR Probability signal. 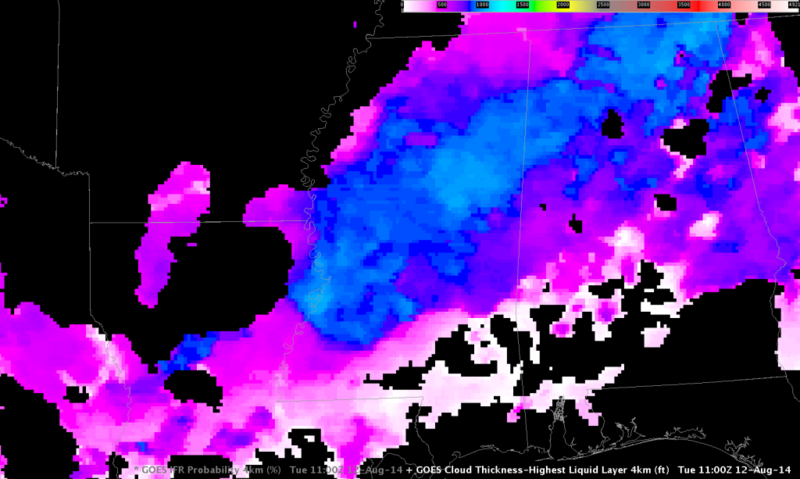 In those regions, the Rapid Refresh model is correctly suggesting that low-level saturation is unlikely. This entry was posted in Midwest on August 20, 2014 by Scott Lindstrom. There are different ways to alert a forecaster to the presence of a transporation hazard like low ceilings and reduced visibilities. 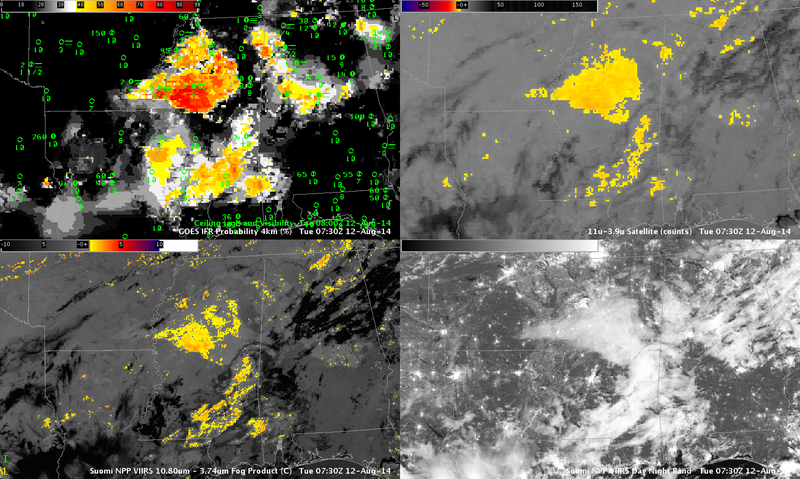 The imagery above shows GOES-based (nominal 4-km resolution at nadir) products (top) and Suomi/NPP and MODIS-based products (nominal 1-km resolution — or better — at nadir). The Brightness Temperature Difference from GOES (upper right) overestimates the region with lowered ceilings; in contrast, the IFR Probability field (upper Left) is able to distinguish between elevated stratus and low stratus because it includes information from the Rapid Refresh model to identify regions with saturation in the lowest levels of the atmosphere. This allows the IFR Probability to screen out regions of mid-level stratus. The Suomi NPP and MODIS Brightness Temperature Difference fields do not suggest widespread stratus as does the GOES-based Brightness Temperature Difference field. Rather, the data from the polar orbiters suggest regions of stratus or fog in river valleys over Kentucky, Indiana and Illinois. MODIS-based IFR Probability (Lower Right) agrees with the GOES-based IFR Probability field: a region of fog/low stratus is developing over southwestern Indiana and southeastern Illinois, near the Wabash River. In this case, the model data is helping to strengthen a weak signal in a region where fog is present. Model data is a key strength in the IFR Probability field. Polar orbiters give excellent horizontal resolution, but only GOES provides the high temporal resolution necessary to monitor the development of fog/low stratus. The toggle between 0800 and 1100 UTC, below, for example, depicts an increase in fog. A single GOES satellite can (and does) monitor that increase. A suite of polar orbiters would be required to give similar temporal coverage in middle latitudes. This entry was posted in Midwest, MODIS, Suomi/NPP on August 4, 2014 by Scott Lindstrom.